This is my fourth book from the Britmums Book Club and arguably my favourite so far (I am still ploughing my way through the third one!) The great thing about book clubs, whether they be virtual or one where you actually meet real people, is that you get to read books that you wouldn't necessarily pick out yourself but are utterly brilliant. 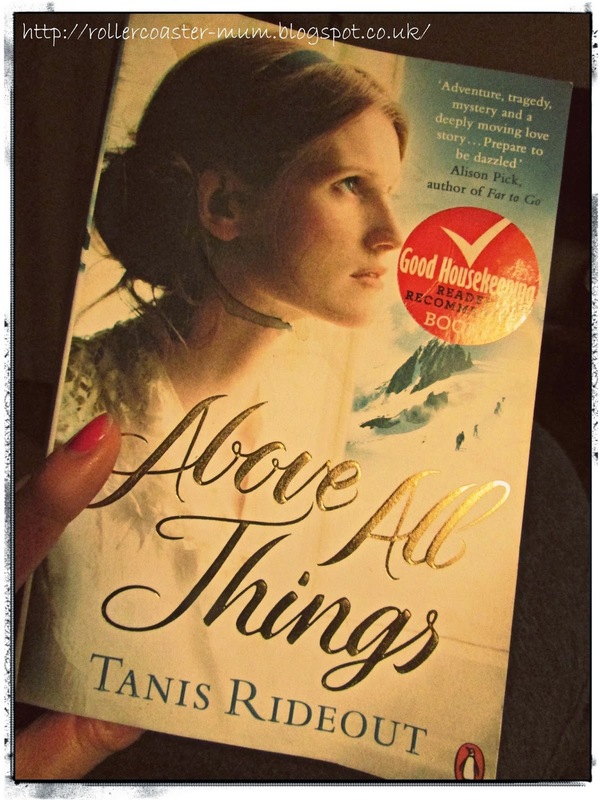 'Above All Things' is one of these books. I'm pretty sure I wouldn't have picked it up in a bookshop. The cover makes it looks a bit like historical romantic fiction and even the description on the back is more love story than adventure and I'm not really a love story kind of girl. It is based on the real story of George Mallory and his third fateful expedition to conquer Mount Everest in 1924. It is told through the three main characters, George himself, his climbing partner Sandy (Andrew Irvine) and his wife, Ruth Mallory. Ruth remains at home in Cambridge with their three children living a relatively mundane and ordinary existence whilst George and Sandy and the rest of the expedition make their way through exotic India and up in to the stark, harsh and unforgiving terrain of the world's highest mountain. This is a powerful book. It draws you slowly at first and then faster to the inevitable and terrifying conclusion. It was a few chapters before I really appreciated the book and by the end I almost didn't want to continue reading. Being a true story you know there is no real happy ending but like Mallory was drawn to Everest you cannot help but carry on. Tanis Rideout was fascinated by Mallory's story and researched it in great detail before writing the book and you can feel that in her characterisation, both Ruth and George really do come alive on the page. I was relatively unaware of George Mallory and his attempts on Everest before reading this book and so I have to admit to reading the Author's Note at the end before I read the book. I do like to know the background of a book if there is one (it's the OCD in me!) Maybe I shouldn't have but I think even if you know his story you will still enjoy this book. It is possibly one of the great mysteries of the 20th Century as to whether Mallory reached the summit in 1924 or not. If he did then it was a huge achievement as it was almost 30 years before the successful expedition of 1953 with Sir Edmund Hillary and Tenzing Norgay. The book has also got me wanting to read more, not only on Mallory but also on Mount Everest and the recent tragic and somewhat controversial events have really brought it home to me that Chomolungma, as Everest is known in Tibet, is still a very harsh and dangerous place. Disclosure: I was sent the book for free as a member of the Britmums Book Club but all views and opinions are my own. I read the authors notes too..... I really enjoyed the book. I have made a note of this as it sound fascinating, it'll make perfect reading for my holiday. I think novels based around true events are usual good and certainly more believable than a lot of the pure fiction that is written. Great review. It sounds like the one to read. Thank you. I wish I had more time to read, I have a few half read books I must finish! I stopped joining in with the Britmums Book Club but your first comment has made me want to start again - you DO read things you wouldn't choose and when you're at a loose end it's sometimes nice to have someone else to choose for you! It's a great book, I love the mix of fiction and fact. I feel as if I am relaxing with a story and learning something.